Children Of Bodom's seventh studio album of original material is unfortunately further confirmation that the inspiration has run out. Although Relentless Reckless Forever is marginally better than 2008's Blooddrunk, both albums are perilously inferior to the band's best work. The manageable length of Relentless Reckless Forever is appreciated: nine tracks are appropriate for any CD, and the lack of padding helps to achieve an acknowledged briskness. 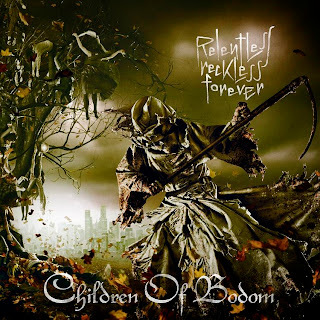 Sadly, only three of the tracks come close to delivering Children Of Bodom's signature combination of keyboard-infused melodic death metal with stunning guitar solos. Opener Not My Funeral starts proceedings with a lot of promise, riding a menacing riff and threatening guitar work from Alexi Laiho, with a delicious tone reminiscent of the classic Slaughter Of The Soul sound. Roundtrip To Hell And Back slows down the pace, something Bodom don't do often enough, and immediately the sound is sharper, the band is tighter, and the music more in control. Laiho and Janne Warman share the spotlight, bouncing the melody back and forth between them to good effect. Was It Worth It? is the other track worth mentioning, an aggressive fuzz-heavy riff leading into a chorus with epic overtones. The rest of the material fails to connect, generally sounding like warmed-over fragments of ideas that never fully developed into a respectable meal. Pussyfoot Miss Suicide is particularly frantic in search of a useful thought that proves elusive. Relentless Reckless Forever is actually Intermittent Sputtering Sometimes. Produced by Matt Hyde and Children Of Bodom.